WFT has an extensive holographic origination facility that includes plate coating, test lab and origination recording studio. 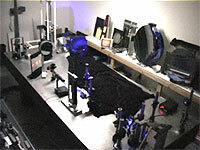 The origination recording studio can produce one-of-a-kind Holographic Optical Elements (HOE') as well as traditional and complex security display holograms. Hundreds of gratings have been produced with different frequencies and modulations for various applications. WFT has mastered the world's largest (65" x 65") crossed diffraction grating that is used to produce seamless holographic packaging materials. Holographic images can be custom originated or even originated with combining techniques using our library of holographic textures.